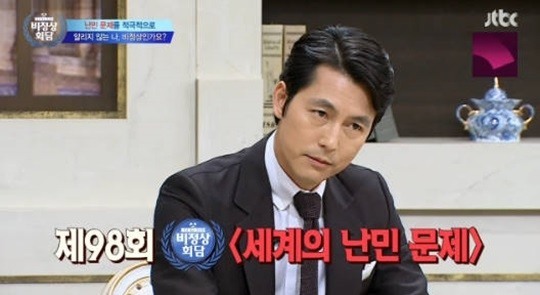 Veteran actor Jung Woo-sung awed the public with an extremely interesting talk on the refugee issue on JTBC talk show “Non-Summit,” Monday. Despite the fact the topic has rarely been covered by the Korean media, Jung opened up the talk as part of the debate session of the program. “Some people ask me ‘Why should I help refugees?’ Well, we have a lot of people around us who need help and refugees are some of them.” he said. With one of the most loved celebrities in Korea giving an impressive talk on the refugee crisis, the unfamiliar topic soon heated the studio, with the hosts and guests deeply engaged in the debate. 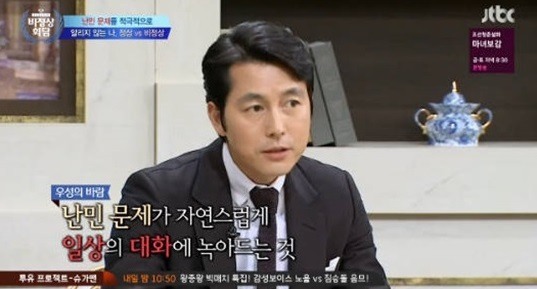 Even after the discussion, one of the hosts sincerely thanked Jung for teaching the public about such an important issue.